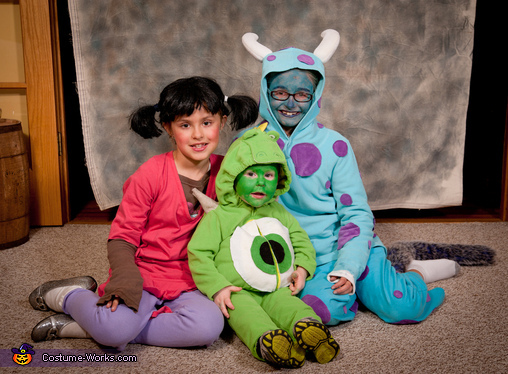 My three kids ages 10, 8 and 2 are wearing Sully, Boo, and Mike Wazowski from the movie Monsters Inc. We LOVE the movie and I thought it would be fun (and cute) to coordinate them this year. I ended up making them from primarily thrift store finds. On Sully, I cut out the purple circles and liquid stiched them onto the turquoise outfit I found. I also found a vikings hat that had horns and cut two slits in the hoodie and pushed those through. Found the tail and pinned that on the back and mixed face paint colors to get the turquoise on her face and a blue eyeliner for her eyebrows, nose and mouth. On Boo, I found an oversized pink shirt with a brown long sleeve for underneath for warmth, since we live in MN. I found the wig (yes, at the thrift store) and cut the pony tails to length and trimmed the bangs. We used mascara on her eyelashes and added blush and lipstick to finish her makeup. On Mike, I started with a dino costume from Costco as the base. I cut out felt pieces from a craft store to make the eye and the mouth and hand sewed them on. I also rolled up the horns from felt and sewed those on his shoulders. Finished him with some green face paint. Skinny Sully, Mini Mike and Beautiful Boo make up my three monsters.